I am a gemini and let’s just say I LOVE to win. But I also really like playing the game, so it’s fun for everyone playing. Teaching our kids though, it’s important to teach not all games are about winning. That it’s also about having fun along the way. And that you can win or lose as a team. This sets the stage for playing in sports team too! 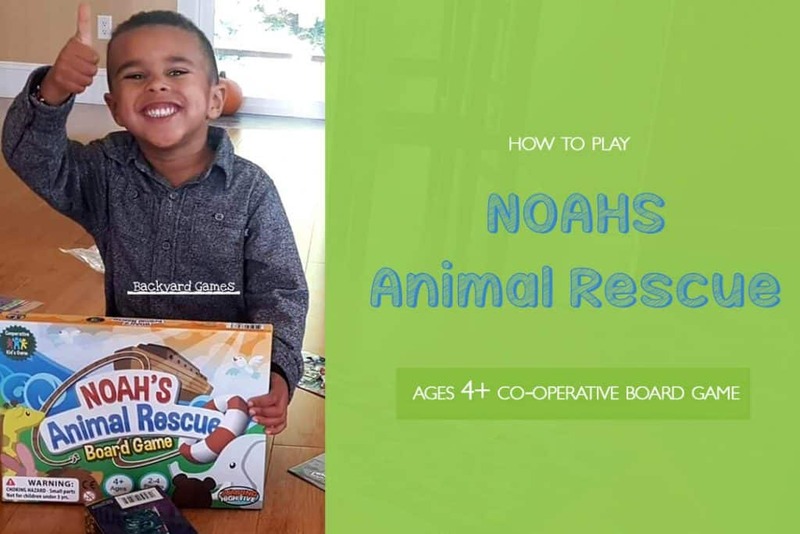 Enter Noah’s Animal Rescue. 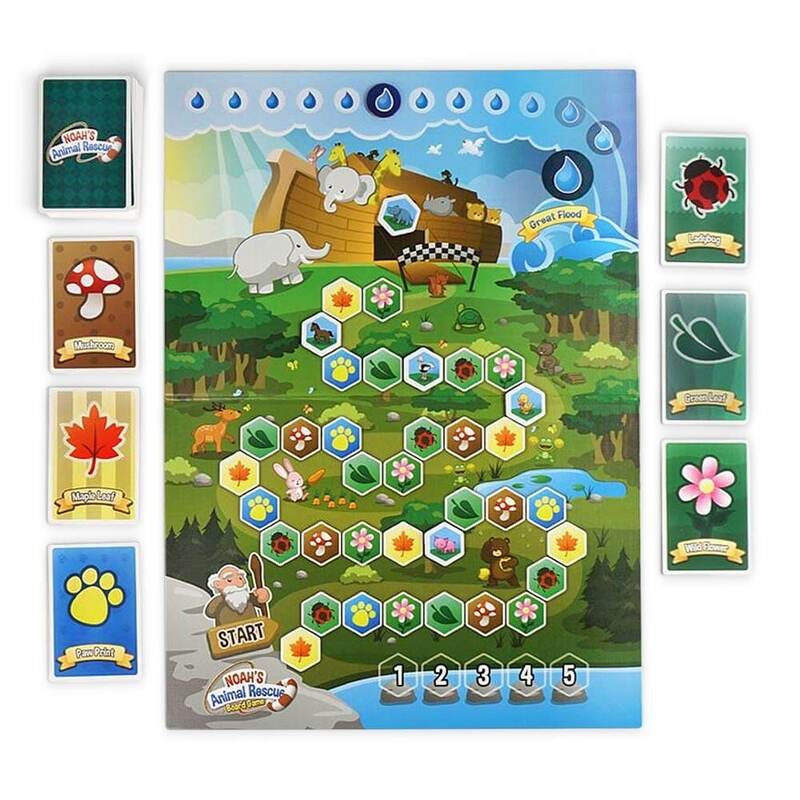 Co-operative games are a new type of board game, that are designed for all players to work together. If all players, together, can’t make it to the end, then no one wins. So this encourages being a team player, helping each other out, and strategizing as a team. Noah’s ark board game was a hit for our nephew. We could see how it helped him develop his counting skills, his matching skills, his strategy and team player skills. This was one of his first board games at 3 and half. This is not a sponsored post, we bought this board game as a gift and thoroughly enjoyed playing it. In fact, his mother was kind of annoyed with us because he loved playing it so much he would play for hours straight. As great as this board game is, hours a day for weeks at a time does warrant being annoyed. We were not allowed to leave their house without playing atleast 3 rounds of Noah’s Ark Animal Rescue. Noah’s Ark is a traditional bible story where Noah dreams that there is a massive flood coming. Noah sets out to build a boat big enough to house all 2 of all the animals on the planet. This preschool game plays on that story in that you must get all the animals safely to the boat before the flood arrives. So instead of practicing your winning dance, practice your group dance off. 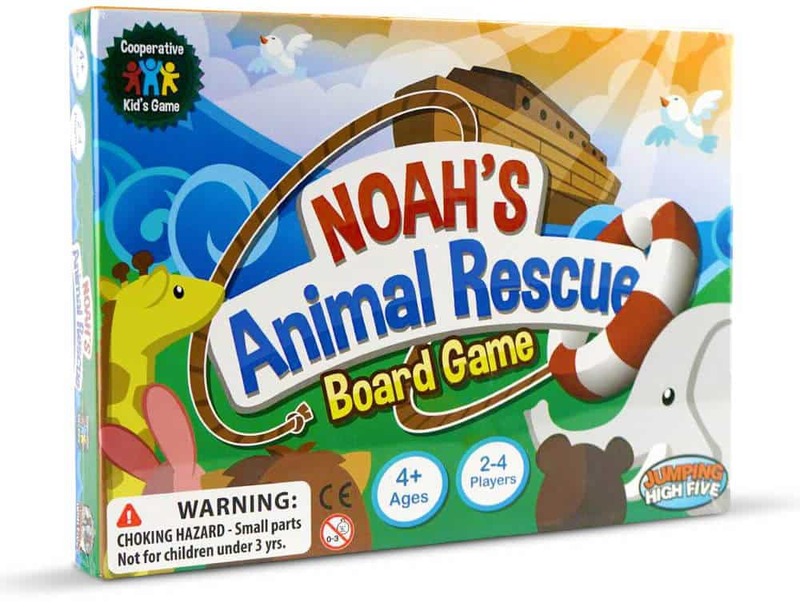 Here’s how to play and our review of Noah’s Ark Animal Rescue. Jumping High Five is a small business and the brains behind this brilliant kids games. Click here to get the latest price on Amazon. Games should be simple to setup, and simple to explain, otherwise you can quickly lose kids interest. My nephew loves to explain the rules of how to play this game to me. Place the flood token on the first raindrop space at the top of the board. Shuffle the 36 terrain cards and place face down. Deal 3 cards to each player. I like that this board game allows you to select your difficulty. 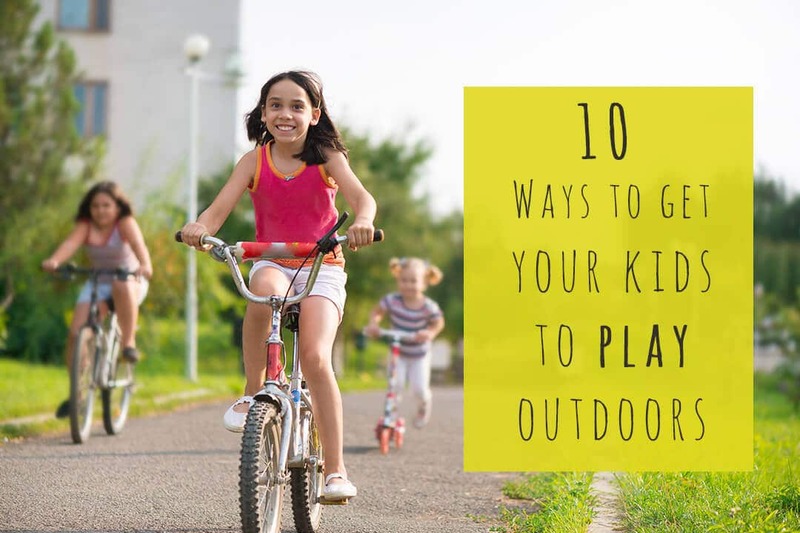 Especially if you are playing with kids at the beginning age of 4 and can advance from there. This ensure the game doesn’t get boring and keeps and added challenge. Get all the animals to the boat before the floor arrives. Most of the animals are already on the boat, but you must navigate the terrain as a team to get the last 5 animals onto the boat before the flood arrives. If you do not get all five animals on the boat, the whole boat sinks. Choice 1: When one of the 3 cards in your hand is a rain card, you MUST play the rain card. When a rain card is played, advance the rain token another space at the top of the board. Choice 2: Play a terrain card and place it in the discard pile. Move any animal to the first corresponding space that matches that terrain card. If there is an animal already on the closest terrain space, advance the animal to the next matching terrain space. This advances the animals much farther. This is important to work together if you occupy the same spaces, other animals can travel much farther. 2. After you have either played a terrain card or discarded a rain card, then pick up another card. Always ensure you have 3 cards in your hand. Now it’s the next players turn. *At the end, if there are no unoccupied spaces left for the card that you played, the animal can leap safely into the ark. 3. The game ends when all the animals have safely boarded the boat. If the rain drop beats you though and the flood arrives first, all the animals are swept back to the starting place. Try, try again! If you only play one type of terrain card, you will leave the other animals behind, it’s definitely best to keep the animals grouped. Like in a herd. It can be a bigger challenge for a group of 4 kids to work together, you risk one child trying to be the boss. I love how Noah’s Ark Animal Rescue emphasizes on co-operation instead of competition. There is definitely a chance that you will lose. There is a challenge for the group as a whole to win. With a super quick 10 minute game time, there’s plenty of time to try again. I also like games that have that added challenge so that kids can practice learning good sportsmanship. Parent supervision is suggested when playing in groups of mixed ages. It might be harder for the older children to work together with the younger children. These are all valuable skills to learn, turn taking, working together, communication, problem solving. And like many good games, there’s also a bit of luck. 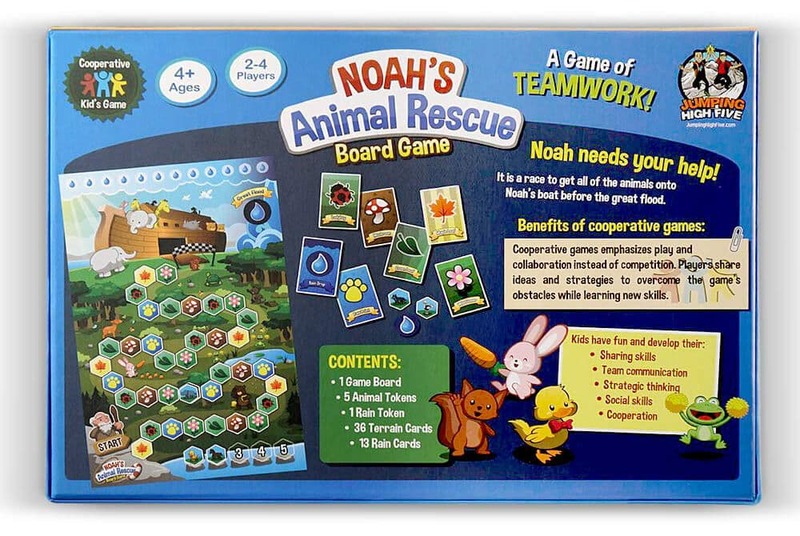 Noah’s Ark Animal Rescue Board Game is featured as one of 20 board games for kids. 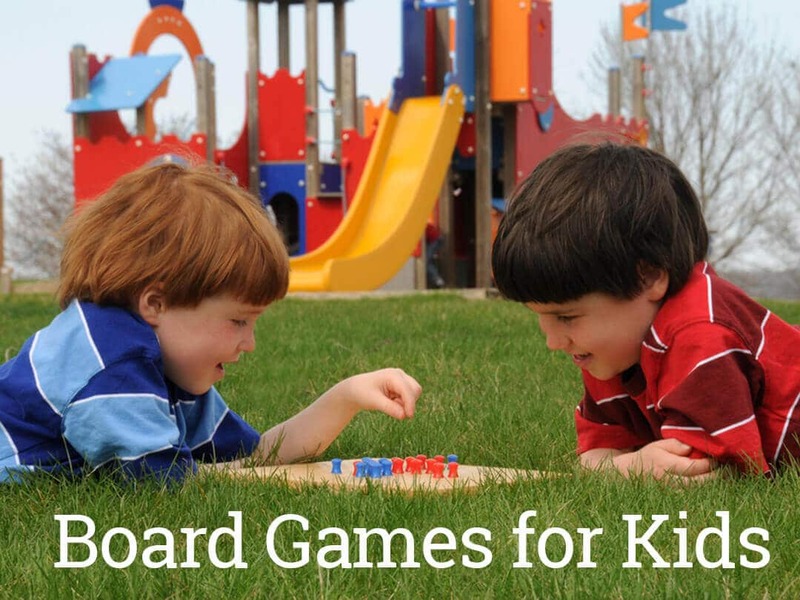 I think this is a great family board game night idea, have you played it? What did your kids think? Leave a comment below.